Donations to Midlands Air Ambulance have "slowed down dramatically" in the past two years due to bogus collectors, the charity has said. 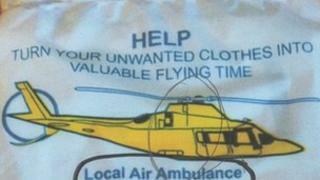 The bags suggest the proceeds will go to the Air Ambulance Service but were not sent out by the charity. The charity said anyone who was unsure about collections should contact it. The bags display the charity number for the Warwickshire and Northamptonshire Air Ambulance, which said the collections were not being made on its behalf. Trading Standards in Worcestershire said it was aware of the bags being delivered and it was investigating the matter. The Midlands Air Ambulance is a charity and receives no government or National Lottery funding. The charity said it needed to raise £6m each year to operate its three air ambulances. Since 1991 Midlands Air Ambulance has responded to more than 34,000 missions.